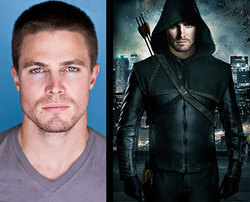 Stephen Amell plays the title character in the CW's hit series Arrow, based on the famous DC Comics superhero, The Green Arrow. Known by day as Oliver Queen, the spoiled heir to his tycoon father's empire, he moonlights as a crime-fighting vigilante, utilizing skills he gained while shipwrecked on a remote island for five years. Arrow's premiere drew over 4 million viewers, making it the CW's most watched program in over three years. Throughout its first season, the show continued to be a ratings and critical success. Previously, Stephen appeared as a series regular on the 3rd season of HBO's Hung. He played "Jason," an attractive young busboy who gets recruited into the world of Detroit gigolos. At the same time, Stephen had recurring roles on Fox's comedy New Girl opposite Zooey Deschanel, as well as a romantic arc with Amy Brenneman as EMT "Scottie" on ABC's Private Practice. In 2011, Amell played the role of Joran Van Der Sloot in Lifetime's Justice for Natalee Holloway, which told the story of Beth Holloway's quest to bring Joran, the presumed killer of her daughter, to justice. Stephen received praise for his chilling performance as the Dutch sociopath. Other notable appearances include guest-starring roles on CSI: Miami, NCIS:LA, Vampire Diaries, and 90210. In the fall of 2007, Stephen won a Gemini Award for Best Actor in a Guest-Starring Role for his work in Regenesis, a dramatic series on Canada's The Movie Network.